We've chosen 13 photos this time and they cover our time in Ecuador (except the Galapagos Islands), Spain, England, and a sneak peek at Turkey. Note: When we last left you, Jessica had signed off with a bit of a cliffhanger, promising to tell "in our very next post" the story of one of the most amazing experiences we've had on our trip. Jessica and I made each other a promise before we left home: we both agreed that I shouldn't propose to her during our trip. For one thing, we were worried that an otherwise exceptionally romantic and special night somewhere could be tinged with disappointment if it didn't end in a proposal. For another, there is absolutely nowhere I could have hidden a ring: on a trip like this, you come to know each others' luggage inside and out. So we promised. It was a promise I never ever intended to keep. Each year, Jessica gets to celebrate her birthday twice. On October 6th, her actual birthday, we celebrate with friends. And then the following day we celebrate her birthday again, this time just the two of us. This year, because we were in England visiting friends, we pushed back our private celebration of her birthday, planning on doing it when we got to Istanbul. And then I started stalling. I had in fact planned from the beginning to propose to her on her birthday. It was the one day that I could go through all sorts of special secret preparations without her wondering why. And because I wanted everything to be absolutely perfect, I kept pushing it back. Further, and further, and further... until everything was right. Until Saturday, November 26th. She loves candles. From time to time during our trip, we've had a few candles with us, for those times when we just wanted to make everything feel that much more cosy and special. 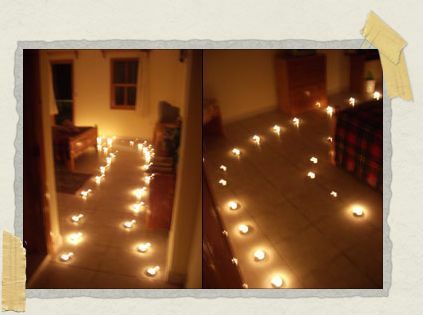 I like to surprise her by lighting them whenever she's especially down: candles always seem to make her smile. I wanted the night to start with more candles than she'd ever had before. By a stroke of luck, I'd noticed packs of tea lights when we were at the supermarket: 6-packs, 12-packs, 20-packs, and even 50-packs. One night, on the pretense of going to the internet cafe, I'd snuck out and bought one of the 50-packs. Then, thinking about it, I bought a second 50-pack. On November 26th, we walked home from a delightful dinner at the charming little English pub we've become quite attached to. I made her wait outside in the hall for a moment (well, perhaps a touch longer than a moment) and ran inside to get everything ready. When I opened the door for her, a little path lit by lit candles led her out to the balcony. There, dozens and dozens more illuminated a table set with a collection of little munchies, and three birthday presents. I couldn't hide one on me before we left, without taking the risk of her discovering it. I couldn't buy one while we were on the road: we know each others' bank accounts just as well as we know each others' backpacks, and for a ring to be worthy of this purpose it would be far too expensive to escape notice. And most importantly, we're trying to travel without anything irreplaceable. Something as important and special as an engagement ring would be far too devastating to lose or have stolen. All the same, though, I knew I could never propose without a ring. It was months before I figured out what to do. It was without a doubt the most important moment of my life. Every detail is etched forever into my memory, and there is far, far too much to try and relate here. There isn't space, for instance, to describe her presents: it is enough to say that, step by step, they led the two of us towards what was coming without ever making her aware of what was happening. I had solved the riddle of the ring. There's a ring we bought together in Argentina that she always, always wears. With some help from her final present, I got it from her without her realizing what was happening. I placed the ring into a very special box, told her I was going to perform some magic, and asked for her help. When we opened the box again, I asked her if she could see what had happened. She shook her head, staring at the ring uncomprehendingly. I told her that the magic had changed the ring, that together she and I had changed it into... something else. I was holding the ring, still in the box, and slipped down onto one knee without her even realizing. I told her that I loved her. I told her that I wanted the two of us to be together for the rest of our lives. I told her that was why, the night before, I'd slipped away while she slept and called her father from the hotel lobby. To ask him for his blessing. Realization flooded across her face, and tears began streaming down her cheeks. I told her that there was a magic in the ring now, and that when we got home we would draw it out, and put it into another ring... one with a diamond. I told her that if anything ever happened to this ring before that, that would be ok, because we could put the magic into another ring. My goal had always been to take her entirely by surprise. In this, I was more successful than I could have hoped. She was almost in a daze, blinking and asking for reassurance that I was serious. Her cheeks were tear-stained, her eyes were wide, her lips were trembling. I told her that she was the most wonderful thing that had ever, ever happened to me. I told her I couldn't remember my life before her, and I couldn't imagine my life without her. My heart was pounding between my ears, and my throat was getting tight. Everything that has come to pass in my life, good and bad, has led to this. Every single choice I've ever made, including all those I may have regretted at some point, every single one has led me here. To this. 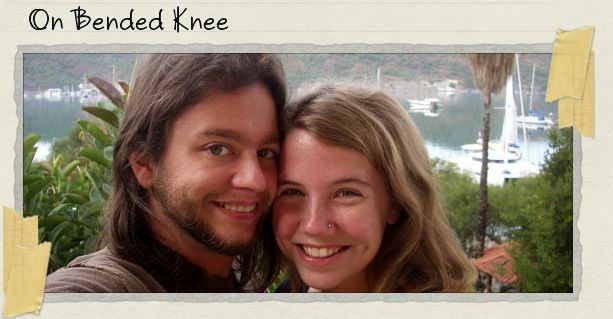 "Jessica Danielle McHugh," I asked, my voice breaking, "will you marry me?" She stood, her eyes alight behind fresh tears, and she placed her hands on either side of my face. "Yes," she whispered, "oh yes, my best beloved. Yes." Home Again After our Honeymoon! Just in case anyone is wondering, we haven't set a date yet. But we're guessing it'll be sometime in 2007! You two are trying to make me cry, aren't you? OK – not fair – tears in the eyes at work is not a good thing – excellent post CONGRATULATIONS! Thanks so much for sharing the good news. You guys are too darn cute! Nice to know romance of that proportion is still alive & kicking out there. Enjoy! P.S. – We'll try to keep the work coming now that we know saving for a wedding is in the works! I knew it! I knew it! I knew it! HA! Congratulations to both of you--I am so unbelievably happy for you! I am so happy for you! Congratulations! Oh God, I am so happy for you two! Congratulations on all of your new beginnings! *Simp, simp, simpy, simp* YEA, I finally got another sister! (Doing manic happy dance) Uh oh, do I have to wear a dress to the wedding, and does it have to be pink? (doing a rendition of Munch's scream cuz I hate dresses especially pink ones) Anyway, congratulations I'm so extrmely happy for both of you. So, when's the party? You know I love a good party… Oh, do I have to bring a date to this thing cuz I'm still annoyingly single. Right before you left I told Pete that I thought you might come back from this whole thing engaged. I am *so* good. Beautiful, beautiful proposal, Tim. The written account alone made me mist up. Jessica, I guess you could not really say NO under the circumstances! But that's ok as it is clearly meant to be. Wow, that's awesome. Congratulations you guys. Tim, I never believed you when you told all of US that you wouldn't get engaged while away. BTW, with all the fun, adventure, and romance you two are having we're all wondering if you're ever going to come back! Every time an AXIOM'er doles out a little freelance work your way we shout, "Stop being an enabler!" Oh! I cried, reading this. You two are so lovely together, such beautiful souls. I'm so happy for you! Happy Holidays to you both. awww! Congratulations! That is awesome! Best proposal ever! I'm all sniffy now! Congratulations! You two made me cry! That was truly romantic, and it couldn't happen to two nicer people. Congratulations to you both! Magical on ALL accounts. Congrats you two. Now pass the tissues! Oh wow!, if that's not the most wonderful, romantic, sweetest story ever. I had tears in my eyes and a big goofy smile the whole time. I'm so, so happy for you two! Congratulations Jessica and Tim. I am so happy for the both of you. I look forward to hearing more and more of your wonderful and exotic travels. Congratulations! I am so happy for you! you guys. now i am all choked up. i love you both. you are so incredibly blessed. Congratulations, Mom…Do I get to be a flower girl? Marmalade wants to be one too! We both love and miss you two. i'm grinning from ear to ear, just reading this account. congratulations to both of you, may you always cherish each other the way you do now. special people! so much love to both of you. Congratulations, what a wonderful story and so well written! We will be waiting for our wedding invite with bated breath! Jess…"oh yes, my best beloved. Yes." is the perfect answer, to a perfect question ! But seriously Jess and Tim, I wish you all the happiness in the world, for now and forever ! Just flicked on LJ for the first time in months, and wondered how you were doing! Awwww Congratulations to you both! What a wonderfully gooey write up! Ah…China will be the only cat at the wedding as she will assassinate any other cat that gets in her way…"MEOW"
Hey, I didn't know Jess' middle name was Danielle. Congratulations. This is one of those wonderful things that is both unexpected and completely expected. I read this entry this morning and had to jump up and down for a little while to express happiness. You guys keep on happying. We are so happy for you both! Last night, travelling through the environs of Columbus, Ohio. we toasted your happiness at Max & Erma's! What a wonderful, wonderful thing! We were thrilled to be visiting the "clan" in MD over Thanksgiving, when we heard the news and could celebrate with everyone. Wishing you both Magic always in your life together. Congratulations, Tim and Jessica! Jessica, we knew from the first moment we met you that you were "the one." We are so very happy for both of you! YOu guys are so beautiful we love you so so much congratulations to you both and you really are so perfect for each other and well, YOur just great and lovely and wonderful and amazing. How wonderful! We are all thrilled for you. Your room is ready for your next visit, on your honeymoon perhaps! Muff, Phil, Rachel, Petal, Sandy and Rufus! Tim is sooo romantic! Even I am envious. Welcome to the family Jessica. Well congratulations and all that, I haven't met Jessica yet, but having followed your blog a bit, it certainly seemed to me that two souls had met their other half. So I don't really need to wish you all the best (as that is happening already) but I'll think it all the same. You guys are beautiful. Congratulations and all of my love to you both. A big congratulations to both of ye! I'm really happy to hear the news and wish ye many years of happiness! I must admit that the candles were a really nice touch. I hope we told you already but myself and Marguerite got engaged just before we got home September. I failed on the candles side of things but it was pretty special all the same. So does Pig sit on the bride's side or the groom's side of the church? Or is he gonna be best pig? Yeah.. Jenn was right.. Reading this made me cry. Hi, someone told me about your travel blog yesterday and I think your adventure is really amazing. I've enjoyed reading your posts and looking at pictures. I'm leaving in two weeks to go to Thailand and Cambodia, so I'll be interested to read about your experiences of it. I'll only be there for three weeks and then back home, but I really want to do an around the world trip in a few years. Thanks for sharing all your experiences and inspiring me to want to visit countries I hadn't considered before. And congratulations. Late on the congratulations but no less enthusiastic. Loved you like a daughter and now I have a pretend son-in-law. My how my family grows. Once the wheel of love is set in motion there is no absolute rule. Guide each other and do not lead but walk hand in hand; for in sharing there is love and wisdom. you don't know me, but you brought tears to my eyes as this was the first of your posts that I read. Bravo, good job. Every girl could wish for something so perfect. I pop on to your site every now and then to read about your adventures and day dream a little. I love that you're living out your dreams! I am soooo happy for you! SUPER HAPPY CONGRATULATIONS! I got all teary and smiley reading about your proposal. What a wonderful story!